When you compare the statistics for Wikipedia and Wikisource, the Wikipedia in Hebrew gets more eyeballs than all Wikisources combined. When you consider the potential public for both projects, the public for Wikisource is bigger by orders of magnitude. On the main page of the English Wikisource it says: "We now have 783,122 texts in the English language library". It is less clear how many of these texts are in a final form; meaning ready for casual readers. The pages linked to the proof read tool indicate 691 completed pages and 3588 pages ready for proofreading. This does not imply that there are 691 text that are ready. For a reader, the sources at Wikisource are works in progress. 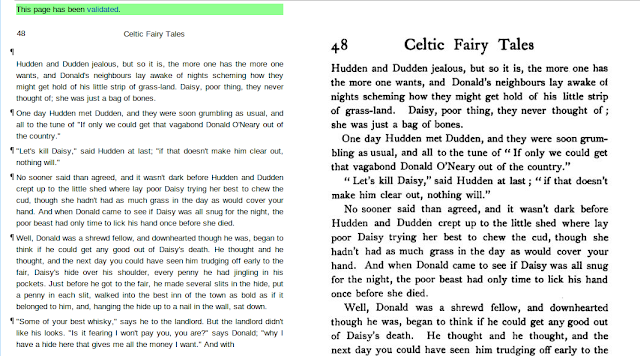 A text featured on the Wikisource main page, like the Celtic Fairy tales, is very much a Wiki page. The presentation of the text and illustrations is very much accidental. It is a bit sad is, but the pages where easier to read when they still needed to be proofread. As you can see, the long lines below are not easy to read and the font used in the original book made the text more legible. The Hebrew Wikipedia is easy to read. We can and should do better for Wikisource. Readership is a problem, and I don't know any easy way to solve it. The "long lines" problem, however, can be solved with dynamic layouts. For all proofread texts there is a display options menu on the sidebar. Clicking "Layout 1" under this will cycle through the available default layouts, as well as any in your own preferences. I think "Layout 2" is what you're looking for. It's based on the French and Italian Wikisources, using a narrower central column and a serifed font.